Once, Imam Ali bin Hussain (as), our 4th Imam encountered some lepers sitting on the roadside and eating their food. Greeting them, he passed by, when all of a sudden he stopped and said to himself: "Allah (SWT) does not like the haughty ones." Having said this, he retraced his steps and approaching the lepers, said, "Presently, I am in a state of fasting (and thus unable to sit down and share your food). However, I invite you to come to my house and be my guests." They accepted the offer and went to his house, where Imam Ali bin Hussain (as) fed them and helped them by giving them some money. During the time of Imam Ali bin Hussain (as), our 4th Imam; there lived a person in Madina, who used to make people laugh to earn his livelihood. Some people suggested that they should invite Imam Ali bin Hussain (as) and allow this person to make him laugh a little in an attempt to sidetrack Imam Ali bin Hussain (as) from his deep lamentation. They gathered together and were on their way to his house when they saw him coming towards them, accompanied by two of his slaves. When Imam Ali bin Hussain (as) came near, the comedian took the cloak off Imam Ali bin Hussain's (as) shoulders and put it over his own. The people around burst out laughing when they saw this antic. Imam Ali bin Hussain (as) inquired, "Who is this person?" The people around him answered, "He is a person who makes people laugh and receives money from them for his antics." "Inform him that those who expend their lives in a futile way performing absurd acts shall be the losers on the Day of Judgment," advised Imam Ali bin Hussain (as). After hearing this, the comedian stopped his annoying behaviour and mended his ways. After the martyrdom of his father Imam Hussain (as), the 3rd Imam the army of Yazid cut-off the heads of all the martyrs of Karbala and removed them from their bodies. Then they left those bodies without burying them. They did not allow Imam Ali bin Hussain (as) to bury these martyrs. Instead, they took him a prisoner to Kufa, Iraq. After the army of Yazid had left for Kufa, Iraq, the tribe of Bani Asad, who lived in the neighbourhood of Karbala, came to bury the martyrs. Since there was no way by which they could know whose body belonged to whom, they were worried. Suddenly, they saw a man on a horse coming in their direction. Fearing that this could be a spy of Yazid coming to check on them, the Bani Asad went into hiding. The man came where they were hiding and called them to come out. He told them that he was Imam Ali bin Hussain (as) and had come through miracle from Kufa, Iraq to help them identify and bury the martyrs. In this way Imam Ali bin Hussain (as) buried the martyrs and his father Imam Hussain (as) where they lie buried today. His coming to Karbala was very important for two reasons. Firstly, an Imam from Allah (SWT) has to be given the burial services, when he dies, by the Imam who takes over from him. No one could give the burial services to Imam Hussain (as) except Imam Ali bin Hussain (as). But he was miles away and in chains as a prisoner of Ubaydullah ibn Ziyad in Kufa, Iraq. Imam Ali bin Hussain (as) therefore came to Karbala by Miracle or Mojeza. Secondly only he knew who was who. Otherwise, we would never know who was buried where the way we know today. After the martyrdom of his father Imam Hussain (as), our 3rd Imam at Karbala and after Imam Ali bin Hussain (as) had returned to Medina, some people began to consider Muhammad bin al-Hanafiya as their Imam. Muhammad bin al-Hanafiya was Imam Hussain's younger brother. 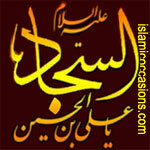 He was very pious and had not himself said that he was Imam. Only some misguided people began to consider him as their Imam. Another version says Muhammad bin al-Hanafiya claimed that he was the Imam after his brother, Imam Hussain (as) [as Imam Hussain (as), had become Imam after the eldest brother, Imam Hasan (as)]. It became necessary to remove this misunderstanding. Therefore, Imam Ali bin Hussain (as) and his uncle, Muhammad bin al-Hanafiya decided to go together to where "Hajar Aswad" (the Black Stone near Holy Kaaba) was, during Hajj season, when thousands of pilgrims had assembled for the pilgrimage. The stranger than fiction news must have spread like wild fire that Imam Ali bin Hussain (as) and Muhammad bin al-Hanafiya wanted the Black Stone to judge between them. Everyone must have wondered how could a stone judge between two persons? They must have eagerly waited to see the outcome when the two parties would approach the Black Stone. What would they say when the Black Stone, being a stone, would not respond to their arguments! This must have been the feeling of the crowd when the uncle and the nephew slowly advanced towards the Black Stone. At first, Muhammad bin al-Hanafiya addressed the Hajar Aswad asking it to confirm who the Imam was? But there was no reply. Then Imam Ali bin Hussain (as) addressed the Hajar Aswad. Aloud and clear voice came from "Hajar Aswad" saluting Imam Ali bin Hussain (as) by his full name and confirming that he and he alone was the Imam of the time. 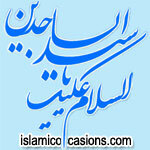 Sa'eed ibn Jubair was one of the steadfast and loyal companions of Imam Ali bin Hussain (as). Al-Hajjaj ibn Yusuf was a bloodthirsty tyrant who had ruled over Kufa, Iraq and Iran for almost twenty years after being appointed by the Bani Umayyah and Bani Marwaan. He had killed nearly one hundred and twenty thousand people during his reign, and amongst the friends and descendants of Imam Ali (as) murdered by him, were individuals like Kumayl ibn Ziyad, Qambar, the slave of Imam Ali (as) and Sa'eed ibn Jubair. Al-Hajjaj ibn Yusuf ordered Sa'eed ibn Jubair to be arrested when he became aware of Sa'eed ibn Jubair's belief and inclination towards Imam Ali (as). Initially, Sa'eed ibn Jubair fled to Isfahan, but when Al-Hajjaj ibn Yusuf came to know of this, he wrote to the governor of Isfahan, seeking his arrest. The governor possessed a high regard for Sa'eed ibn Jubair and therefore advised him to leave Isfahan for a safer resort. Acting upon this advice, Sa'eed ibn Jubair set out towards Qum and then proceeded to Azerbaijan and then to Iraq where he sought to enter the army of Abd al-Rahman ibn Muhammad, who had initiated a rebellion against Al-Hajjaj ibn Yusuf. Abd al-Rahman ibn Muhammad was defeated and Sa'eed ibn Jubair fled to Makkah where he lived in hiding. During that period, Makkah was under the rule of Khalid ibn Abdullah Qasri, a ruthless individual, who had been placed there by the Umayyad Caliph, Al-Walid ibn Abd al-Malik. Al-Walid ibn Abd al-Malik wrote to him and gave him the order to arrest the well-known Iraqi personalities who were hiding in Makkah, and to send them to Al-Hajjaj ibn Yusuf. Thus, he arrested Sa'eed ibn Jubair and had him dispatched to Kufa, Iraq. At that time, Al-Hajjaj ibn Yusuf was in Waasit, a city near Baghdad, where Sa'eed ibn Jubair was eventually brought. Al-Hajjaj ibn Yusuf questioned Sa'eed ibn Jubair about himself, the Holy Prophet Muhammad (saw), Imam Ali (as), Hazrat Abu Bakr, Umar ibn Khattab, Uthman ibn Affan and many others and then asked him: "How should I put you to death?" "Whatever manner you may adopt to kill me, you are bound to be chastised accordingly, on the Day of Judgment," replied Sa'eed ibn Jubair. Al-Hajjaj ibn Yusuf said: "I would like to forgive you." "If the forgiveness is from Allah (SWT), then I seek it, but if it is from you, then I do not desire it," responded Sa'eed ibn Jubair. Al-Hajjaj ibn Yusuf shouted, "Don't waste any more time! Kill him!" Sa'eed ibn Jubair testified to the Unity of God (Tawheed) and the Prophethood of the Holy Prophet Muhammad (saw) and prayed: O' Allah! Do not grant Al-Hajjaj ibn Yusuf respite after me in order that he does not kill anyone else. As he uttered these words, the executioner severed his head. After the martyrdom of this epitome of perfect faith, Al-Hajjaj ibn Yusuf suffered a derangement of his senses and did not live for more than fifteen nights. 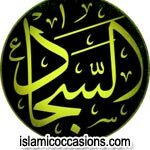 Before his death, he would occasionally lose consciousness, but regaining it, he would repeatedly mutter: "Why did I ever get involved with Sa'eed ibn Jubair?"